Please note that the prices below should be regarded as indicative prices and estimates only. 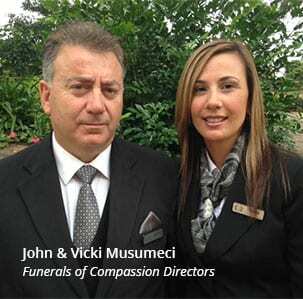 The prices are based on information obtained over the phone, price lists and/or email quotes from Funerals of Compassion. Prices with an asterisk* are estimated solely on the average prices charged by funeral homes in the state. For more on how we obtain our prices, please see our FAQs. For an exact price quote, contact Funerals of Compassion using the message form on this page. Funerals of Compassion have now conducted several funerals for my family and friends. John, Rocco and Bede constantly demonstrate that the “compassion” in their business name is real, and they go out of their way to ease the suffering of those left behind. 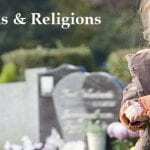 At 71, I have attended (sadly) too many funerals, and have observed many funeral directors and service providers. 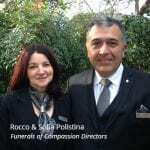 I have no hesitation in choosing Funerals of Compassion to conduct my own service and I recommend them highly. John and staff were amazing. The day was definitely a perfect send off for my brother Mark Borg.